Jeanne Archer on Will it Float ... Will it Float? Will it Float ... Will it Float? We're heading for a Wedding.....! That Will Rodger's Folly's tune was on my mind this weekend. 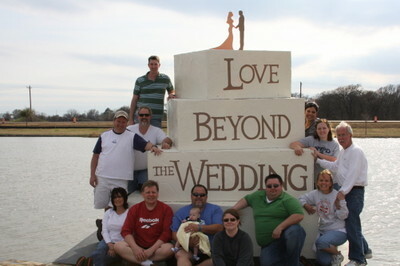 Yes, it's all about the Wedding Cake branding for our new series "Love Beyond the Wedding." We've been building a giant 8 foot cake designed to float in Valley Creek's Pond as part of the promotion. We also build a smaller (but still pretty big) 7' Cake to be on display in a local Town Center. It's all about the Branding. I could hear the theme song of David Letterman's recurring game "Will it Float" in my head as we watched the giant Wedding Cake take sail into Flower Mounds largest body of water. When I read your first post wondering if it would float, all I could hear was Paul singing, "Will it float? Will it float? Will it float? Will it float?" Did I read "its all about branding" or did you mean to say "its all about Brandi"? Anyway, where is my music?